The drawings will be the focus of the exhibition Art for the People: Carl W. Peters and the Rochester WPA Murals, which opens at MAG on October 18. In spring 2015, Gallery received a $5,000 mini-grant to support photography and imaging for the exhibition. The award, from the New York State Council on the Arts, is administered by the Museum Association of New York. MAG is one of 196 not-for-profit organizations nationwide selected in fall 2014 to receive a Museums for America award from the Institute of Museum and Library Services (IMLS). The highly competitive, $24,085 award will be used to conserve 22 high-quality miniature paintings from the Gallery’s Asian art collection. 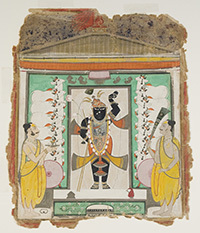 Many of the paintings—which represent about 30 percent of the Indian, Persian, and Nepalese miniatures in the collection—have never been on view because of their fragile condition. Following year-long conservation treatment, they will be exhibited in the Asian galleries in rotation with other light-sensitive items. Pictured: Visitors to the M&T Bank Clothesline Festival enjoying Centennial Sculpture Park. Photo by Richard P. Wersinger.